For the JAI #4 challenge, I made a card with a really easy bow with a button featured on it. I've been asked how it's done, so I've made a little tutorial for you. Cut two pieces of ribbon. One will go around the card and the other will form the bow. The piece you cut for the bow should be only slightly longer than the final size you want your bow to be. The top piece in the photo is the ribbon doubled over, so it's slightly bigger than the end product will be. Put a small piece of Sticky Strip at one end of the smaller piece of ribbon. 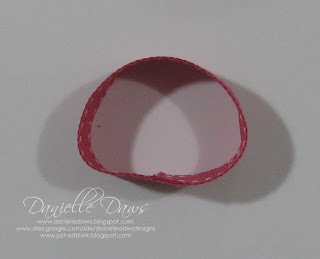 Peel the backing off the Sticky Strip and stick the two ends of the ribbon together - it will form a circle. 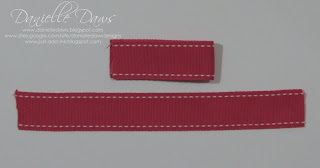 Sandwich your layers together - the base ribbon, the bow with the join on the bottom in the centre, and the button with string already threaded (encircling all the layers) - as shown in the photo. This is the tricky bit. 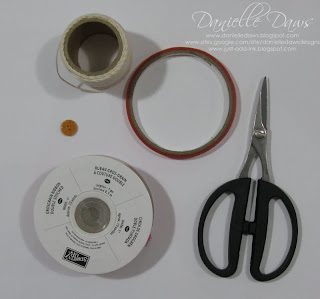 Pinch the layers of ribbon together with your thumb and index finger. 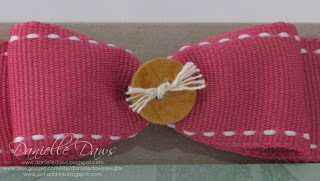 You want to gather the base ribbon and the bow so they sit together well - this is how the bow will look at the end, so make sure you're happy with the gather. 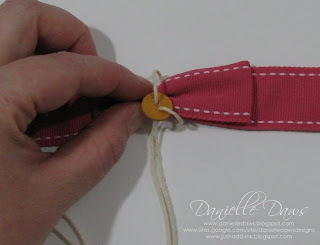 With your free hand, slide the button down the string (so you're pulling the string through the button) until it is sitting firmly against the ribbon. Double check how everything is sitting, then pull the string very firmly and tie a double knot. Trim the ends of the string. This is where using no extra adhesive is a real benefit - you can now fine tune your bow and you can even pull the bow through the string if it's not centred. The finished bow! All you need to do now is to attach the bow to your card however you wish. 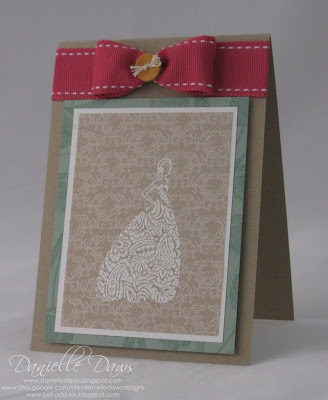 The ends of the ribbon can be concealed inside the card by placing a piece of cardstock over the top. Interested in learning how to make your own button like the one I've made here with More Mustard card stock? Click HERE. Thanks for this Danielle, I too wondered how this was done .... fantastic tutorial, very clear, precise and terrific pics!!! Thanks for this!!!!! Love your tutorials. Thanks for the tutorial Danielle. It's so great to see it step by step! Love the tutorial for the ribbon. I always have trouble using this ribbon so this gives me heaps of inspiration for using on cards or other projects. thanks for sharing. Great tutorial. It's just what I needed. Thank you!!! Wow it is so easy when you know how, thanks for the clear instructions. I am in love and must re create!!! Thank you!!! 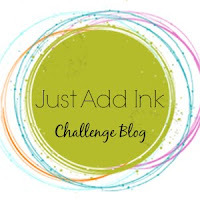 Just Add Ink Challenge 4 - A Colour Challenge! We Want To See YOUR SPACE!